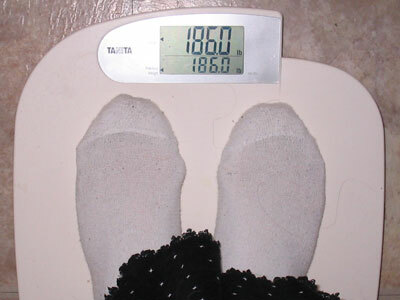 Weight: 186 – Party in PastaQueen’s fat pants! After 770 days this blog has finally earned its name. Half of me is gone! I’m just glad I didn’t go with the James Bond villain method and cut myself down the middle with a laser beam. It would have been quicker, but I’d have lost my depth perception and halved my typing speed . Everyone is invited to a virtual party in my fat pants! Trust me, there’s room for everyone. Below is the money picture. It was difficult to take because I used my camera timer, so I had to hop across my kitchen and pivot around and smile in under 10 seconds. However, I am now prepared for the Potato Sack Race World Championships, if ever they should be held. If all the fat bloggers ever get together, we should hold a sack race in our fat pants. Even if I end up bouncing back up next week, I can now honestly say there was a time in my life when I lost half my body weight. Only another 26 pounds to go! I am soooo happy for you! Party on, PQ! Your half-of-you photo is awesome. How cute are YOU! Congratulations, honey — as a young woman, you have quite literally saved your life (not just your health). Go forth and shop. Mad cheering – wow!!!! Wonderful picture, too. what joy! What a great picture, you smiling so happy, after bouncing around the room. Great work! freaking BRILLIANT pq!!!! congratulations :) you look fantastic. This is amazing! Congratulations…your continued hard work has paid off! I breathlessly waited for this page to load, wondering if TODAY WAS THE DAY!! IT IS! IT IS! Congratulations, you so deserve it! And I hope the book makes millions! OK, onward to those last few pesky pounds . . .
Congratulations!You should be proud of yourself. OMG! You look fabulous!! Congrats, you are such an inspiration. I have been a long time lurker from Day 1 – never posted before today- I think (LOL). I just had to say you look AMAZING. GREAT JOB!!! Congrats! That is sooooo awesome! The pics are very striking – you really have lost half of yourself! Great job! You are an inspiration!!! Keep on doing what you are doing now, and the rest will practically take care of themselves! You did it! Heartiest congratulations! And a book! And 160 exclamation points! And you earned every one of them!!!!!!!!!!!!!!!!!!!!!!!!!!!!!!!!!!!!!!!!!!!!!!!!!!!!!!!!!!!!!!!!!!!!!!!!!!!!!!!!!!!!!!!!!!!!!!!!!!!!!!!!!!!!!!!!!!!!!!!!!!!!!!!!!!!!!!!!!!!!!!!!!!!!!!!!!!!!!!!! oops, that was supposed to be 186 exclamation points. Here are the rest: !!!!!!!!!!!!!!!!!!!!!!!!!! Oh my lord – CONGRATS!! You’ve worked SO hard! What an INCREDIBLE accomplishment – GO YOU!! You look really cute in the leg of those pants. I hope you don’t ever quit celebrating. What an accomplishment. Wow! Don’t take this the wrong way, but the pic looks like one of those “A-MAY-ZING weight loss in JUST 30 DAYS” ads. Back up a minute: you did it the right way, and its STILL AMAZING! You look great, and as I’ve commented before, not just your body. Your face, your writing, it ALL looks great. Wow, congrats! I just recently found your blog; you are such an inspiration! you look SOOOOO CUTE, PQ! You are like this adorable lanky smiley athletic little thing!! How fabulous! Many many congratulations. You must be dancing with joy! That is one gorgeous picture! Half-of-you makes a pretty damned spectacular whole-of-you!Congratulations… oh my god, I’m actually welling up with tears of happiness for you! This is so great!! ALL my clothes are now size 6 petite, but you ALMOST make me wish I had kept one pair of my old size 26 + pants to take such a picture. You, my dear, get my biggest, baddest, loudest, most heartfelt “WOOHOO CARROTS!” ever! You look like a total skinny person. How amazing are you? Horray hoorryaaa W00t W00t . . . loud noise making . . .
and a delightful photo. . . thanks for hopping across your floor to do it. . . .Someday there will be a convention of those who can fit into one leg of their fat pants and we will hold the race!! I love the shirt too! You must love buying clothes a little more than before, eh? I hate buying clothes when I’m fat, but thank God for Penningtons… (kinda like layne bryant i guess)… we only started getting them a few years ago, I have no idea how I survived as a fat chick before then…. Good job on the lose! Hooray! Well done! I love the idea of potato-sack races in fat pants. Wow, PQ, you are really, really, really looking good. Look at your tiny torso!! The diff between even 190 and this 186 pic is startling. You must be working out a lot. Way to go pastaqueen! And you got to 1/2 way on my bday….wooohoooo! You look great in your big pants, that’s go awesome. wow, i am soo happy for you! congratulations! Amazing! I am so thrilled for you! Congrats! fantastic! congratulations, you look fab! I figured this would be the perfect time to stop lurking and comment! Congratulations! You’ve come so far, and that picture of you in your old pants is breathtaking…you look so happy (and great). That is freaking awesome and incredible and thanks for showing us all! I love the mental image of you hopping across the kitchen to take the pic. I was so pleased for you when I opened your blog today. I made my family come and look at the picture of you in your big pants-you look amazing. I’m inspired to keep working toward my goal, especially since I got so much joy out of seeing you reach this incredible milestone! Party on Pastaqueen!! You look so elegant and graceful (perhaps not what a kick-boxer wants to hear, but still)and cool and confident. I have never been so happy for someone I don’t actually know! YOU ARE BLOODY FANTASTIC! 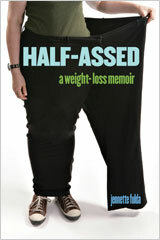 I have half of me pants like that too, though I didn’t quite lose half of me, I was about 8 pounds off it. Your pants picture will look fabulous in your book! My girls (ages 9 and 13) LOVE your twirling progress pictures – they get on and play all the time! congrats on your 1/2 body weight loss!!!!!! Well done, and fantastic photo! Sooooo wonderful! Congratulations. You’ve done a fantastic job. All the best words have already been used. You look so adorable (and TINY) in that last picture – congratulations! You look fantastic – not only because of your weight loss but because you look so darn happy! Congratulations. Congrats!!!! You look so awesome, I can’t believe there’s another 26 extra pounds on you! Congratulations! You worked hard at this and I love, love, the picture! Let me join the chorus and say congratulations. You look wonderful! You go, girl! What a fabulous and inspiring accomplishment! Wow you look amazing!! Congrats! Congratulations!! You look adorable!! You will be a veritable goddess at 160. Wowowowowow! You look so amazing! Congratulations! Congrats :) keep it up. Words fail me. When I grow up I wanna be just like you. Congratulations!!!! whoo hoo!!!! congrats!I’m incrediably happy for you!! !Yea Pasta Queen!!! wow! wow! wow! Congratulations on your hard job. I’m very proud of you so I can only imagine how proud you are of yourself. You look great, specially that big smile on your face. Wow, I’m really happy for you (and a feeling a wee bit of envy.) But mostly happy. I love the expression on your face, you’ve so earned this. wow… you are the coolest pasta queen!!! Abso-frakin-lootely FANTASTIC!!!! I’m doin’ the HAPPY DANCE for you! What a wondeful day! You must be so proud. I know I’m inspired and impressed. Keep up the fantastic work! you know, I could be wrong, but am I the only one who thinks PQ looks SO much healthier than people who lose through WLS? You don’t have that turkey neck, drained look some peep who lose that way do. You look like you’ve never been fat. You just look really young and lanky and lean and healthy. You look great. I hope we get the glam photos when you get to your goal weight. I’m thrilled to join you for a party in your fat pants! But, I guess I probably shouldn’t bring a celebratory cake, should I? You’re so cool! I’m so happy for you. You’ve worked so hard. Yeah, you did it! I’m so happy for you. I’ve been reading your blog for quite a while now and have been anticipating this moment. Now you out and buy some new clothes as a treat to yourself. You have earned it. I’m not saying anything that hasn’t been said a 100 times already, but damn, you look amazing! I’m so so happy for you! And yeah, I think the fat pants race is a plan and a half. gorgyyyyyy!!!! im so happy for you. I screamed with delight when I read this!! CONGRATULATIONS!!! Buy yourself some shoes ! CONGRATULATIONS !!!! You deserve all of it. good for you! what an awesome accomplishment – and what an inspiration for us all ! you deserve every pound – keep up the great work! good for you! what an awesome accomplishment – you deserve it! keep up the great work! Great Job! You look super great! One word…….AMAZING. All the best for continued success! You look AWESOME–I almost can’t believe you still need to lose 26 lbs., you look so thin. Way to go!!! What a huge accomplishment!! Okay, since I’m comment #106 there’s a chance you may not even read this, but just in case CONGRATS!!!! You look awesome. We’re all so proud! I’m down 3 lbs and managed to wash the dirt off my exercise ball and get it IN the house. Baby steps for me. I’ve got to get with the program. YAAAAAAAAAAAAY!!!!! This is my first post, but I have been a fan for a while. Hopefully I will have a picture like that next year; you’ve certainly inspired me to believe it can be done from a position of humor, positivity and perserverance, and for that I thank you. 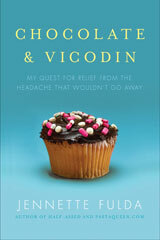 Way to go honey; you deserve the accolades, better life and hopefully a spot on the NYT bestseller list! YAHOO! YOU LOOK AMAZING! Congrats on dividing yourself by two! congrats on living up to your title. it’s practically epic. look out odysseus. I never comment, but love your blog. I had to congratulate you! An incredible journey and I’m glad we got to follow along. Heheheh You Go Girl! this will be comment 113 – my guess is that this post has garnered the MOST comments of any in the history of your blog! This is the on-line party we have all been anticipating! After we enjoyed your post in the fat girl pants, and relished the idea of the fat pants sack races, I posed for my husband in a similar pair of pants. . . .may get around to sending it to you soon. You really do look amazing. Congrats you look awesome! What an inspiration! Congratulations, sweetie! Loki and I are so, so proud of you and everything you’ve achieved! Go buy yourself some celebration clothes! You just might end up with 186 congratulatory comments! Congratulations on achieving this milestone! You rock! OK, so you’re not going to post again until you get 186 comments. I’ll join the ranks! You rock. Dang it! You make me wish I had saved some “fat pants” instead of being so eager to rid myself of the larger clothes so I couldn’t go back there! I have been trying and trying to find motivation to lose weight b/c I am a 26 year old mother of 3 and I am “almost a diabetic” and my cholesterol is awful and I have a heart condition. You are truly an inspiration. You are SO brave for doing this blog! That is SO COOL. I am really proud of you. That’s really really really awesome. And the sky opened up and the angels sang… Congratulations on reaching your Holy Grail! Thank you for sharing your joy, pain, and photos for the past 3+ years. That picture of you with your gorgeous smile is priceless. I am very proud of you and wish you continued success on your wonderful quest. Your story is a gift to all your supporters who have followed you on your journey. Congrats! What an inspiration to us all! Came over here from Mel’s place (Shrinking Mom) and….wow! What an inspiration. Might have to go back and read your archives now! Congratulations!!!! I hope it doesn’t freak you out to have a whole bunch of strangers congratulating you on your marvelous success, but we are all just so darn Impressed. Way to go! I hope to wear my fat pants like that someday. yay you! what happy news for your mind and your body. congrats. So the other day she’s giving me Reiki, which involves putting her hands on different energy spots on my body, and I notice she keeps going back to my heart, as if to check on something. I’m getting nervous and thinking she’s “feeling” that I have a disease or something. But when she’s done, she tells me that, whenever she went over my heart, she got this “vision” of me just being BUFF. BUFF and STACKED and CURVY were the words she used, and she was saying that in the “vision” I looked really happy and healthy, and I was telling her about some guy I was dating. And the sense she got was that this was something I really wanted, and something that was not as hard as I was making it–that it was like I was putting myself into a big, fat suit of armor, and I didn’t have to be in there anymore. She drew me a picture of that “vision” me. I guess I share that because this picture of you gave me the same reaction as this “vision” and picture of me. It’s like there you are, happy and free, and you don’t have your fat coat of arms anymore, because you don’t need it. It kind of shocks me that this can be done. I know there’s a number of people who are happy and healthy with their fat, and that’s really great for them, but I’m not one of those people, not really. And it helps to see that there’s people out there who did change themselves, slowly and sensibly. And it’s weird, because honestly I’ve felt tinges of jealousy and envy each time I’ve read your blog, but this picture provoked neither, really. It was just sort of wonderful and shocking and heartbreaking all at the same time. So thanks. Wow! Now I’m going to have to go back and read through your blog to see how you did it! Way to go! Also delurking to say, CONGRATULATIONS! Been a lurker here for months but just had to post to say congrats on an awesome achievement PQ! You look great! I can’t imagine how you could have 26 pounds still to lose. You look incredible. Way to go. Keep it up. You are such an inspiration! Wow, you look so totally hot. You are amazing. I can’t wait to buy and read your book! This is truly inspirational. I just restarted last week, so I’m adding you to my links and will be back when I feel the need to eat something naughty. You look fantastic and I bet you feel even better! Perhaps I need to invest in home internet after all, that way I can read your inspirational blogs instead of accidentally drinking too much wine on a Sunday and soaking it up before bedtime with a 7-Layer bar featuring 37 grams of fat. WOW! You look so amazing! I always wondered what my body would look like at half it size, since I had started reading your blog that it and got inspired to commit to losing weight for myself. Can you imagine? Look at your nice shape! You got curves, not fat!!! Awesome job! Hey! I have a pair of black fat pants that are going to be kept in my closet, so I can do the same thing when I lose enough weight to show how much more awesome I look as you do now…. Just referred to your site from mary aka healthbites: what a great achievement! you look fantastic. And what a terrific photo. I am in awe of you. You should be so proud of yourself! You are the definition of determination and self discipline. I love to read your blog. It is so inspirational. You have quite a way with words. I will definitely buy your book and I am recommending your blog to all my girlfriends and to my daughters. that is one awesome pic! You are an inspiration! You look amazing in the recent photos! To have the power to change like that… Just amazing. Congratulations x 100! This is awesome and it gives me hope. I started at 419.6 lbs and to date I have lost 99lbs. My goal is 176 so yeah I am looking to lose over half of my original body weight. It’s gonna be a long journey but your blog shows me it’s possible. Congrats a million times over! That is truly wonderful! I know this entry is old… but I have a thing for starting blogs from the beginning when I read them so in the last two or three days I have read everything up to this point and your story is so great! I hope I have as much drive to be successful in my own weight loss adventure! I have to wholeheartedly agree with Eleonore’s comment above – that you’ve shed your “fat coat of arms”, and more amazingly, that over a year later you’re doing even better. You are living the dream of many, myself included. Patience and perseverance embodied! Wow, what a journey, sorry I am so late in reading all of this! I am so behind the times when it comes to blogs! Congratulations on your awesome success and your book deal!!! I got my blog reading start by looking for a crockpot recipe and finding thecrockpotlady, then I found Jenna’s blog around the oatmeal trip, then Kath (kerf) and then you! You are truly inspiring! I look forward to reading your book and I think my mom just offered us her treadmill when we move to a bigger place this spring! Yippee!!! I’m just a new reader who’s read through your journey thus far. I can’t tell you how GOOD this entry made me feel. My boyfriend was super impressed, too. Congrats on everything – you DESERVE it! I love the picture of you when you’re cut in half, and I could just imagine you hopping around trying to get the picture taken in time. I’m in the middle of your book right now. You are such an inspiration! Just finished your book and I loved it! I’ve lost 57lbs so far and I need to lose another 80 to get wherre I want to be….I have to say that your book made me think in different ways as I never did before! I hope you are doing well with looking so good.